Jorge Prado (Red Bull KTM) raced to the win in today’s MX2 qualification moto at the MXGP of Indonesia at Pangkal Pinang, round 12 of the of the FIM Motocross World Championship. Davy Pootjes (LRT KTM) took the holeshot but Prado, who trails his team-mate Pauls Jonass by just nine points in the championship, hit the front within a handful of turns and was never headed as he claimed an important psychological victory. Britain’s Ben Watson (Kemea Yamaha) nailed a great start and quickly moved into second. Jonass then stuck a hard pass for third on Pootjes that left the young Dutchman on the ground which allowed Thomas Kjer Olsen (Rockstar Energy Husqvarna) and his American team-mate Thomas Covington through. 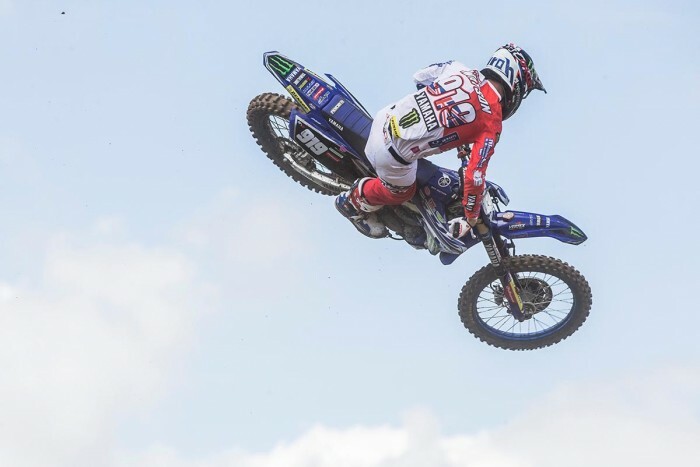 At the front of a depleted field of just 15 series regulars and four local riders, Prado and Watson began to pull clear and after five minutes the Spanish teenager was two-and-a-half seconds ahead of the Brit with Jonass a further five seconds adrift. A big mistake from Jonass let Olsen and Covington close on the rapidly-drying track and four laps from the end the defending champion slipped off and dropped back to fifth. In the closing stages Watson almost got onto Prado’s back wheel but he held on to win by a second to ensure first gate pick tomorrow. Olsen was over 14 seconds further back in third from Covington and Jonass with Calvin Vlaanderen (Team HRC) sixth ahead of Henry Jacobi (STC Husqvarna), Jago Geerts (Kemea Yamaha), Pootjes and Michele Cervellin (Martin Honda). Adam Sterry (F&H Kawasaki), the only other British rider in action following Conrad Mewse’s Hitachi ASA KTM UK team’s decision not to attend, crossed the line in 11th.